Medieval is a rather abused word, often being used to cover everything from the fall of the Roman Empire to…well, gosh only knows. People commonly mash it at least with the Renaissance, which comes with it a healthy sense of irony as Renaissance thinkers very actively separated themselves from medieval culture. The Renaissance was the rebirth of Greek and Roman culture after the long Dark Age (their term) or what we now call the Middle Ages, a.k.a. the Medieval period. Once you get past high school, history is no longer simple memorization. History is cause and effect, and in order to understand that, you need to know when and where things were taking place. There is a habit of negative things being considered medieval and positive things being considered Renaissance (or later), which just emphasizes the fallacy of the “Dark Ages,” which weren’t really quite a dark as people think. But…you can’t expect us to understand all this. We’re not all historians. Very true, you’re not historians. But I commonly see this stuff in, for example, fiction. If you’re going to write historical fiction, research the history. Understand your setting. 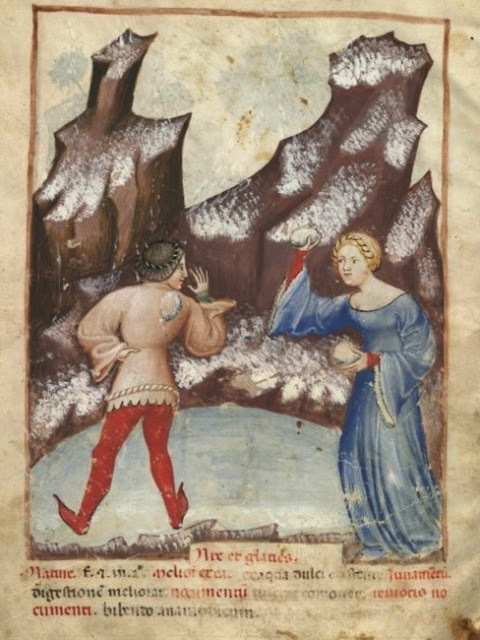 Giving a medieval woman a ball gown is like giving Harry Potter a ray gun. And, no, I don’t expect the average person to know the difference between the 13th and 15th centuries. I do, however, expect people who talk about them to know it. Do I applaud them for outing their own historical absurdity? Does that make it better or worse? I’m so confused. So what didn’t happen in the Middle Ages? 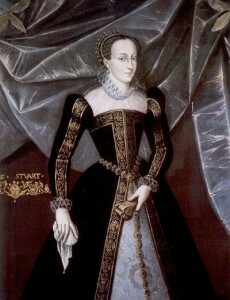 Corsets are Renaissance fashion. They aren’t even terribly early Renaissance fashion. 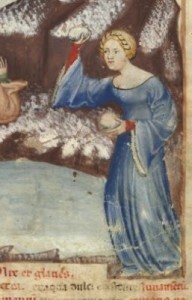 Medieval gowns were much more simple and far less restricting. Moreover, Renaissance corsets were a thing of the nobility. The local bar wench was not wearing a corset. Corsets are restrictive. They aren’t just about making you look skinny. They’re about how your lifestyle allows you to wear increasingly restrictive clothing. The idea of everyone wearing them didn’t come about until the 19th century, and a working-class corset bore little resemblance to that worn by the wealthy. Chastity Belts are largely a thing of fiction. What few examples we have come from later times, and even then they’re rare. Historical image of Mary Queen of Scots, 16th century (Elizabethan Renaissance), As opposed to TV’s really non-historical Mary Queen of Scots. Thanks to TV and movies, few royal families are as well-known as the Tudors, which most notably produced Henry VIII and Elizabeth I. They are not medieval. By no one’s count are they medieval. Henry’s reign is very arguably the beginning of the Renaissance in England (although Italy’s been going at it for 200 years), but we’re 50 years in by the time Elizabeth comes to the throne and, yet, I regularly see the Elizabethan Age described as medieval. Nowhere close. The phrase describing life as “solitary, poor, nasty, brutish, and short” comes from Thomas Hobbes, who wrote in the 17th century. He wasn’t describing medieval society, but instead how he expected the life of humanity to be without the order of civilization. And, yet, again and again people use it to describe history in general and frequently the Middle Ages in particular. YOU MAY LIKE: Inventing Celtic History, or My Continued Quarrel with "Cosmos"
The Middle Ages can span from as far as 500 to 1500CE. Different places at different times certainly faced great hardship, but that is also certainly not the case for the entire period, at least in comparison to any other time period. It is true that life expectancy was about 35 years, but that’s the same for pretty much everywhere at all times until sanitation improvements in the 19th century. Moreover, life expectancy is not a prediction of when you’re likely to drop over dead. It’s an average of ages at death. Until the 19th century, half of children died before reaching adulthood, and a great many died in the first few years of life. Every age of 0 allows someone to live to 70 and average a 35. Plenty of people lived until their 50s and 60s, and lots and lots of children died. Punishments of witches, because humans can be horrible beings, 16th century. The Middle Ages is full of superstition and lack of education, so something as ludicrous as the murder of 30,000 people thought to be cursing the countryside must be medieval, right? Wrong. 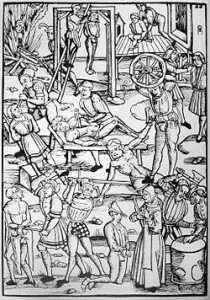 The vast majority of witch trials occurred between the late 15th century and the mid-17th century. That’s Renaissance. The Salem Witch Trials of 1692 are practically in the Age of Enlightenment. In 1492, Spain demanded all Jews and Muslims convert to Christianity or leave. They were perfectly welcome to leave. The Spanish Inquisition investigated those who might not have been sincere in their conversions and were still secretly practicing their traditional faith. Nowadays, everyone just thinks of the Spanish Inquisition as something no one expects. Thanks, Monty Python. There’s a long-running misconception that medieval people were inherently dirty and refused to wash. It is true that the Church tried limiting things like bathhouses, particularly non-gender-segregated bathhouses, but you don’t have to limit things if no one is wanting to do them. And that doesn’t limit taking baths. As one Russian ambassador to France noted “His Majesty [Louis XIV] stunk like a wild animal.” Russians were not so finicky about bathing and tended to bathe fairly regularly, relatively speaking, generally at least once a month. Because of this, they were considered perverts by many Europeans. King Louis XIV stench came from the fact that his physicians advised him to bathe as infrequently as possible to maintain good health. Louis XIV is 18th century. Come on, you’re not even trying. The Black Death, which is western Europe’s first encounter with plague, kills about 1/3 of the population, or about 25 million people, between 1347 and 1350. That date is a murky one: Italy has embraced Renaissance ideas by then, but most of Europe has not. It’s a time period sometimes call the Late Middle Ages. But the plague continued to strike for four centuries, which is all the way through the Renaissance and encroaching into the Age of Enlightenment. (CONT). For instance, in theatre studies, while ir is true that a modern professional theatre developed in London at the end is the 16th Century, forms that are clearly medieval–the religious cycle dramas–are still being created in the middle of the century (during Shakespeare’s lifetime, and only 20 miles from Stratford upon Avon). Going by cultural signposts such as theatre, the Middle Ages in Cornwall lasted into the 17th Century. Even in Italt, new religious drama was being created at the end of the 16th century C.
You are on even shakier ground with the plague, as you declaration can be turned around to say, fairly accurately “by nobody’s count is the 14th Century not the Middle Ages.” Well, maybe by Plutarch’s, but you already established that he is biased. In his major work about the late Medieval period, The Autumn of the Middle Ages, Johan Huizinga writes about the 15th Century, not the 14th. Some people refer to the so-called Renaissance as the “early modern period. Others refer to it as the Late Medieval period. Both camps question whether the Renaissance is actually a thing. Some people put the end of the medieval peri in 1492, (as much because of the Reconquista as for Columbus). Other in 1650 with the death of Charles I. Others put it at the end of the 14th C, when the devastation wrought by the plague allowed for the economic changes that created a mercantile economy. If the Renaissance was indeed a thing, the best date for it is right around 1453, when the fall of Constantinople coincided with the invention of the moveable type printing press. In years previous, Byzantine scholars (who still called themselves “Roman”) fled Constantinople with their libraries and knowledge of the classical period, and went to Italy, wher the new printing press allowed the to finally widely disseminate all the knowledge which most of the West had been ignorant of. Or, of course, the Renaissance could have started in the 12th Century with the founding of the big universities. My point us, periodization is really hard. You should check out Carolyn Dinshaw’s book Getting Medieval for a great discussion on the term “medieval” as a pejorative referring to extreme violence. I can’t recall my exact source, but I did read somewhere that for a lot of what we would call the Middle Ages (I’d guess maybe 11th to 14th century) wasn’t this brutal and difficult time for peasants in particular. Peasants were actually treated fairly well, having regular feasts and being in employment as long as they obeyed the rules set down by their superior. It was when the Black Plague hit that things went horribly wrong, and that period of death and horror is what popular opinion thinks was the Middle Ages. Like any period of history, I’m sure the medieval period was one of multiple layers and nuances, with myriad ideas and customs that are familiar, but also many that seem strange to a modern audience. After all, five or more centuries is a long time.